Comprehensive Compliance - CODEpliance, Inc.
CODEpliance has developed a patent-pending process which allows interested parties (e.g., business or home owners, property managers, insurers, and inspection teams) to quickly evaluate the current status of a fireproofing treatment. When fireproofing is applied, a labelled placard is generated and the monitoring process starts. 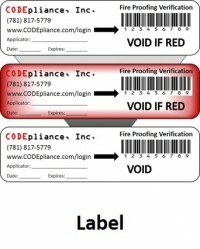 This label is formulated to reflect exposure to water or solvent – two vehicles for weakened fire-resistant properties. A simple visual indicator allows for quick initial pass/fail assessment, and any repainting or resurfacing is readily apparent. Information (project, product, applicator, pictures, etc.) 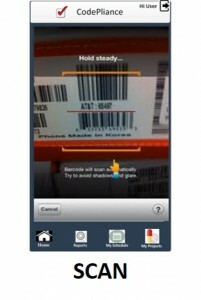 is logged in CODEpliance’s system and associated with an ID number and barcode that appear on the label. By entering the ID into a website or scanning the barcode with a convenient mobile application, documentation is prepared, updates are sent via email or text, and, again, a pass/fail is immediately assessed. Access privileges are assigned to designated Fire Prevention Units, Building Inspectors, Insurers, Property Managers, and home or business owners. 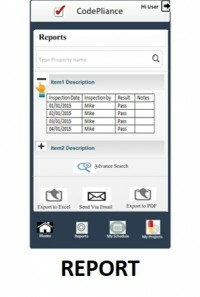 Provided with this information, inspectors can efficiently manage upcoming expirations and recertifications; insurers assign liability and risk; consumers ensure they are protected. A simple click or scan i nstantly reports the fireproofing’s validity, effectiveness, and status. In order to achieve Code-specified Fire Ratings, many industries incorporate passive fireproofing in some form; the primary methods are (1) integration during manufacturing, or (2) post-manufacturing topical treatment. However, both integrated and topical approaches are vulnerable to diminishment from a range of issues – external (UV light, water, solvents, wear and tear) and intrinsic (deterioration over time). Routine maintenance (or lack thereof) also plays a vital role in the longevity and effectiveness of passive fireproofing systems. Most importantly, failure to maintain these treatments is a potential fire hazard, public safety issue, and financial and property liability. Information collection and sharing is largely dependent upon record keeping. Maintaining updated and accurate records is time and effort intensive – this is true whether managing a household or a corporation. In many cases, the system that is in place fails at the most inopportune time: a crisis, an official request, or filing a claim. In the case of a fire situation, the most inopportune time is often a combination of all of the aforementioned. Everyone can agree that prevention is the best way to avoid a catastrophe, but what does that actually mean? More importantly, how can these preventative efforts be tested, maintained and monitored regularly? Fire alarms, smoke detectors, and sprinkler systems are usually the first things to come to mind. There are Codes in place that clearly outline the procedure for maintaining active and integrated fire prevention systems. When it comes to passive systems, the process is more undefined and difficult to assess. Was it applied 6 months ago? 6 years ago? Is it still as effective as the initial installation? Who performed the application? Where they qualified? Certified? Were the products safe? Any legacy toxic effects? Off-gassing? Flaking? Exposure or contact effects? Has the surface been maintained? Properly or improperly? According to manufacturer’s specifications? Has any resurfacing been performed? Painted over? With compatible products? Once or a dozen times? Has it been damaged? Exposed to water or chemicals? Other harmful factors which might impact efficacy? For an Inspector, these questions are nearly impossible to divine from visual inspection and even the best record keeping provides little insight. 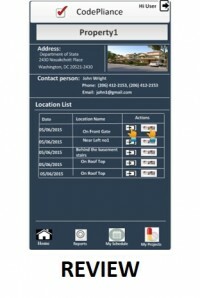 Managing site-specific compliance with hard-copy records is error prone and susceptible to lost, damaged, or incomplete documentation. There is no easier way to manage tons of paper than getting rid of it. First: We collect and digitize everything – images, data sheets, MSDS forms, manufacturing breakdowns, analytical test results, pictures before and after installation. Next: This pile of information is uploaded into a database and organized in a way that searching delivers quick results and eliminates irrelevant information. Last: The results are conveyed concisely and cleanly. Management or Executive teams are aware of their business’ status, plan accordingly, and mitigate risks. Code enforcement officials (AHJ) and Insurance auditors receive a comprehensive packet with all required documentation for inspection and approval. Families and property owners can confidently confirm there are preventative measures in place. To learn more about how passive fireproofing and a comprehensive compliance program can be implemented in your home or business, please contact us.